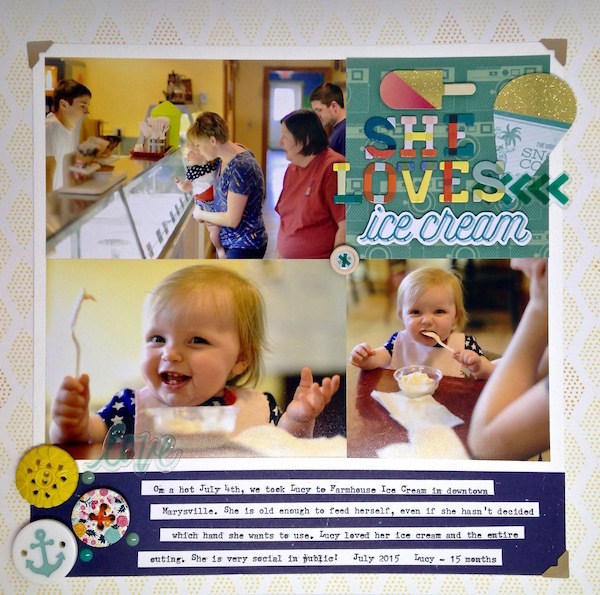 I wanted to scrap these photos from last summer with a story beyond the obvious "we went for ice cream, isn't she adorable?" I sat, staring and staring, until one little detail caught my eye. Our granddaughter is holding the spoon in her right hand in one photo, then her left hand in another. And a personality page was born. So she is experimenting with which hand she wants to use, but that happy face is not just because she is eating ice cream. She loves to go out in public. She love to see things and meet people. She is, so far, a social little girl. I'm glad I took the time to dig for that and record it on a scrapbook page. Cute page and journalling, she'll like that she was once ambidextrous. I like the shot of them deciding what to have too. Lovely page and she is certainly a cutie! What a great smile! Why yes, she is adorable!! And good for you for taking the time to get a little more story on the page. Adorable layout. What a great page! The pictures are adorable, especially the close-ups. Really cute embellies, too! Great job!